A European Ariane 5 rocket boosted two high-power communications satellites into orbit Thursday from French Guiana, including one hosting a $53 million NASA atmospheric science package, after a communications dropout during the climb to space raised fears of a launch failure. Three nail-biting hours after liftoff, Arianespace, the European consortium that markets the Ariane 5 rocket, released a statement saying both satellites were safely in orbit and communicating with ground stations. No details were provided about what might have triggered the loss of telemetry or whether the satellites were released into their intended elliptical orbits. But both relay stations were equipped with on-board propulsion systems to circularize their orbits at an altitude of 22,300 miles above the equator where communications satellites take 24 hours to complete one orbit and thus appear stationary in the sky -- a requirement for commercial comsats. Presumably, both will be able to reach their targeted orbits, but details are not yet known. 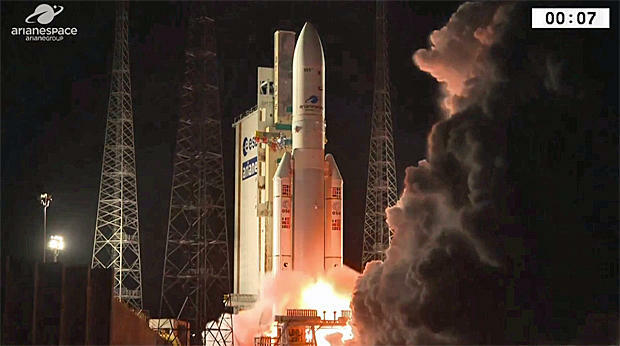 In any case, confirming the satellites were alive in orbit after the loss of telemetry during powered flight was a welcome relief to the owners and to Arianespace, which had launched 82 successful Ariane 5 flights in a row going into Thursday's campaign. "A few seconds after ignition of the upper stage, the second tracking station located in Natal, Brazil, did not acquire the launcher telemetry," Arianespace said in a statement. "This lack of telemetry lasted throughout the rest of powered flight. "Subsequently, both satellites were confirmed separated, acquired and they are on orbit. SES-14 and Al Yah 3 are communicating with their respective control centers. Both missions are continuing." The towering Ariane 5's hydrogen-fueled main engine ignited and throttled up to full thrust at 5:20 p.m. EST (GMT-5) followed by ignition of two solid-fuel boosters that instantly pushed the 1.7-million-pound rocket away from its seaside launching pad at the Guiana Space Center near Kourou. The rocket appeared to climb smoothly through the dark, partly cloudy sky, arcing away to the east of the Atlantic Ocean trailing a brilliant jet of exhaust that lighted up the South American coast for miles around. The first stage appeared to fire normally, shutting down and falling away nine minutes after liftoff. The Ariane 5's second stage engine then ignited to continue the push to orbit. But telemetry disappeared from control room computer screens a few moments later. The Arianespace commentator continued to describe a normal ascent, apparently reading from a script, confirming acquisition of signals from the rocket at various points as it presumably passed over ground stations. He confirmed separation of the SES-14 communications satellite but just before the planned separation of the second comsat, the Al Yah 3 relay station, the commentary stopped. A few moments after that, Arianespace CEO Stephane Israel confirmed the mission had run into trouble. "Ladies and gentlemen, I come to give you some information because we have had an anomaly on this launch," he told flight controllers and onlookers at the control center. "Indeed, we lost contact with the launcher a few seconds after ignition of the upper stage. "Up to now, our customers do not have contact with the satellite. We need now some time to know if they have been separated and where they are exactly to better analyze the consequences of this anomaly." Israel apologized to SES and the Al Yah Satellite Communications Co., saying "I want to present my deepest excuses to our customers." "We know that there is no launch with no risk, we know that launch is always difficult and tonight, I have (garble) an anomaly," he said. "So let's take time now to better understand the situation of the satellite. Arianespace, in full transparency, will come back to you to provide you with some more information as soon as we have them. I apologize on behalf of Arianespace." In an unusual arrangement for NASA, the SES-14 comsat hosted the agency's Global-Scale Observations of the Limb and Disk -- GOLD -- experiment package, designed to monitor Earth's upper atmosphere and how it interacts with the planet's magnetic field and near-Earth space. The 80-pound experiment featured an ultraviolet imaging spectrograph. The Ariane 5 is one of the world's most reliable heavy-lift rockets and Arianespace is a mainstay in the commercial communications launch industry. Arianespace also launches a wide variety of government and scientific payloads and will be used in 2019 to launch NASA's $8.8 billion James Webb Space Telescope. The rocket is being provided to NASA in exchange for observing time on the observatory. The Ariane 5 directly competes with Russian Proton rockets and lower-cost SpaceX Falcon 9 boosters in the commercial launch market, typically carrying two relay stations at a time to orbit. SES routinely uses the Ariane 5, along with SpaceX Falcon 9 rockets. In fact, the SES-16/GovSat 1 satellite is scheduled for launch next Tuesday atop a Falcon 9 from the Cape Canaveral Air Force Station in Florida. The satellite will be operated by LuxGovSat, a joint venture between Luxembourg and SES, to provide communications for NATO operations. GovSat 1 and the Al Yah 3 satellites were both built by Orbital ATK. The SES-14 satellite was built by Airbus Defense and Space. The GOLD imaging spectrograph was built by the University of Colorado Laboratory for Atmospheric and Space Physics and managed by the University of Central Florida.